Alert but distressed in pain, able to speak in full sentences. P 102, BP 126/70, RR 22, SaO2 99% (on air). Heart sounds dual without rub or murmur. Chest: Clear without crackles/wheeze. No pleural rub. Non-tender chest wall without rashes or vesicles. Abdomen: Soft & NT with palpable spleen. Appropriately healing Caesarian scar. No unilateral calf swelling or pitting oedema. What are your DDx in this case? Given the high pretest probability for PE and the lack of an obvious alternate diagnosis, you elect to proceed straight to advanced imaging and send your patient for a CTPA. Suboptimal study; however no pulmonary embolism is demonstrated. 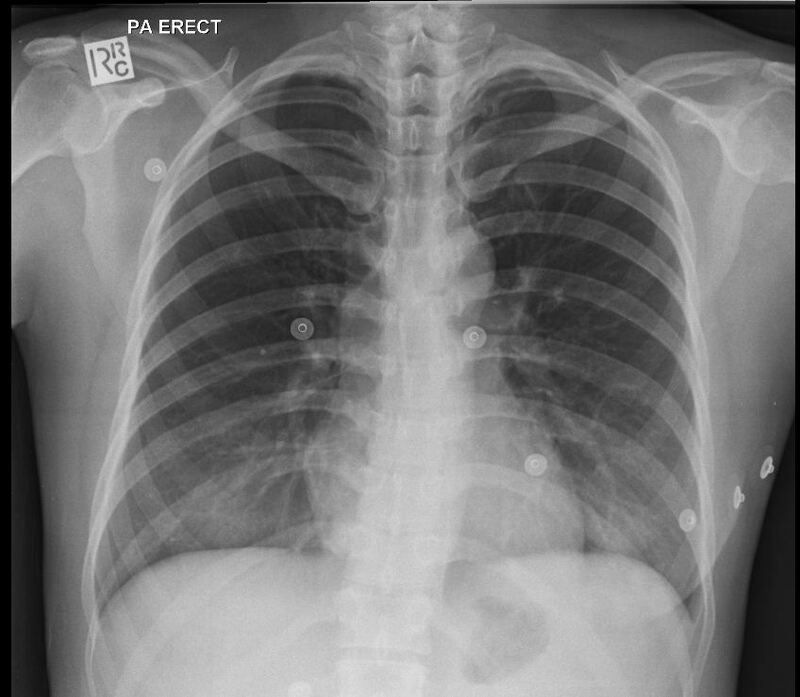 There is mild dependent atelectasis, worse on left. The spleen is enlarged and its hilum faces laterally with varices. It also appears to sit inferiorly to its normal position (under the stomach & liver, and does not contact the diaphragm). It does not demonstrate its normal mottled appearance on the arterial phase. Following a period of observation and titrated analgesia our patient settled and her observations normalised. She was soon keen to go home and keep her newborn out of hospital. She was subsequently discharged with return precautions and a plan to followup with her GP the next morning. 24 hours later, the phone rings…. The consultant radiologist has reviewed the images and amended the report. The patient is called back to the department and the diagnosis explained. She is admitted under the care of the surgeons and she undergoes further advanced imaging…. Arterial phase, axial CT of the abdomen. Red arrow demonstrating the laterally displaced splenic hilum. There are multiple case reports of spontaneous splenic torsion, typically relating to “a wandering spleen“. What is a wandering spleen? It is a rare condition characterised by the abnormal location of the spleen in the lower abdomen or pelvis. This results from increased splenic mobility due to the absence or laxity of its suspensory ligaments. Wandering spleen has been described in patients ranging from 3 months to 82 years of age. It has an incidence of <0.25% of all splenectomies. The causes of wandering spleen can be both congenital and acquired, with acquired risk factors including pregnancy, trauma & splenomegaly. It can occur in all age groups, but classically occurs in 20-40 year old females. There are multiple case reports of splenic infarction occurring in postpartum women. A wandering spleen may present clinically as an acute surgical abdomen secondary to torsion of the spleen around its vascular pedicle. This subsequently leads to splenic capsular stretch, ischaemia and infarction. Although wandering spleen may be found incidentally as a mass in the abdomen without causing any complaint, it may cause chronic, subacute or acute abdominal pain secondary to torsion of the splenic pedicle resulting in vascular inflow and outflow thrombosis. They are often found incidentally at surgery for completely unrelated complaints. Spleen preserving strategies (splenopexy) are reserved for healthy & non-infarcted spleens that are of normal size and without signs of hypersplenism. They are highly recommended in paediatric patients to minimise the risk of post-splenectomy septicaemia. Over the next 4 days in hospital our patient is managed conservatively with analgesia. During this time she developed thrombocytosis (PLT > 1100) and was commenced on aspirin. Given the fact she is now functionally asplenic, she was immunised according to a splenectomy program and was also commenced on roxithromycin 150mg daily (for prophylaxis, given penicillin allergy). She received strict instructions on urgent medical review with onset of fever. Alimoglu, O., Sahin, M., & Akdag, M. (2004). 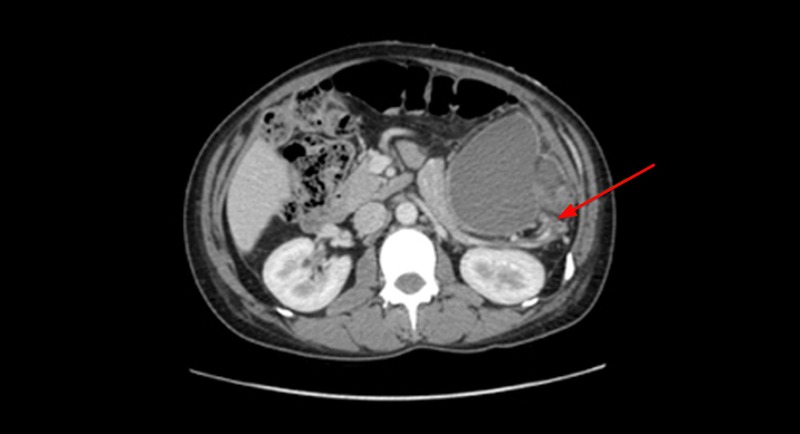 Torsion of a wandering spleen presenting with acute abdomen: a case report. Acta Chirurgica Belgica, 104(2), 221–223.